It should be pretty obvious, but if you don’t have the ability to DO the tasks involved in a job, you probably shouldn’t be doing it! 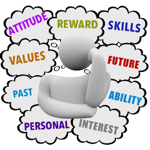 However, can you think of other reasons why it would be helpful to think about your abilities when choosing a career? Like abilities, interests can also play a big part in helping you choose, and be successful in your career. Can you think of any reasons why this is so? Can you work out what your special abilities are? and write down exactly what it is you are able to do well. and write down the things you also struggle with! whether you have, or can develop, these required abilities. Most people find it really easy to say what things they are NOT interested in doing. But it’s not so easy to list the things they really like doing! – Things I Find O.K. Do you know WHY you like/dislike doing certain things? Do some of the things you like/dislike doing suggest to you any jobs which you could do, or maybe should not do? What? Knowing this info will help you a LOT in your career decision-making and in your job search and application! Try to develop an image of your skills, talents, and your weaknesses, by rating your abilities in each category. This time, try to develop an image of what you like and dislike doing by rating your interest in certain things. Move on to the Your ABILITIES worksheet!